Today I will review my new favorite brand of skincare: Celeteque. It all started when I realized I needed to apply moisturizer before applying on makeup in the morning. I am not growing any younger, and I want to start a good skincare routine. I chose Celeteque primarily because it’s very accessible (available in most supermarkets and drugstores) and the price is reasonable. 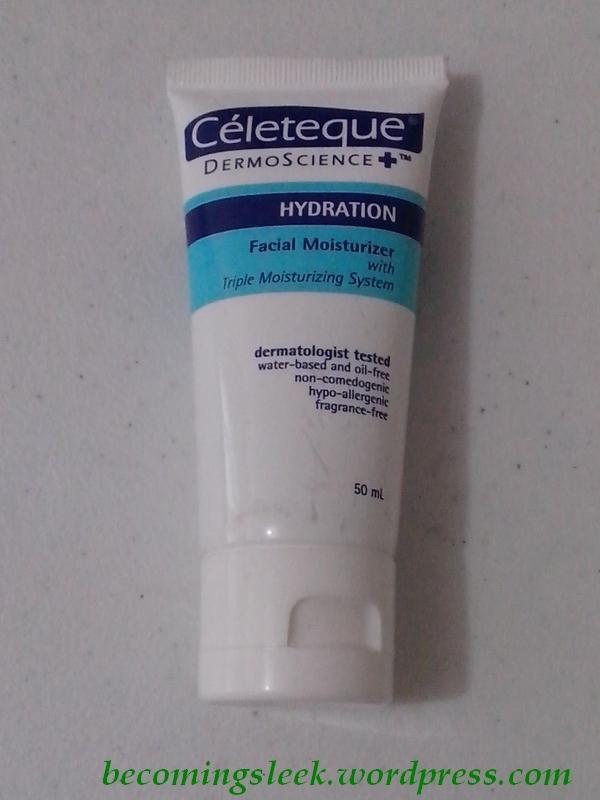 The first product I tried is Celeteque Hydration Facial Moisturizer. This moisturizer applies on very lightly on the face, and gets absorbed fast. This is a huge deal since it doesn’t add up to the preparation time in the mornings, as you will be able to apply your makeup over this a few seconds after applying moisturizer. It keeps the skin fresh and supple even under heavy makeup. This small tube lasts me for a long time (about 3-4 months) and costs only Php127 for the 50ml size, and Php 210 for the 100ml. 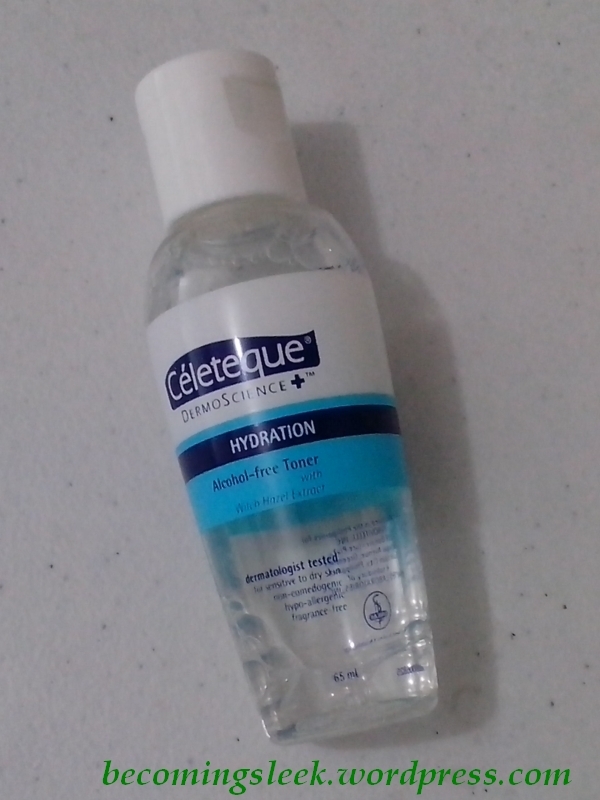 Emboldened with my success with the moisturizer, the next one I tried is the Celeteque Hydration Alcohol-Free Toner. I’ve not had much luck with my toners recently as they all turned out to be too harsh. I always experienced some amount of stinging and I was really getting tired of that. Luckily enough, this toner from Celeteque was very gentle, yet effective enough to clean out my pores. The downside to this is that since this is very watery, you’ll need to put a lot of it onto a cotton pad to effectively reach out to all the pores. I’ve been using this for about a month now, and I have not experienced any stinging or breakout. As a bonus, it doesn’t smell bad or strange. This costs only Php82 for the 65ml bottle, and Php 129 for the 125ml. 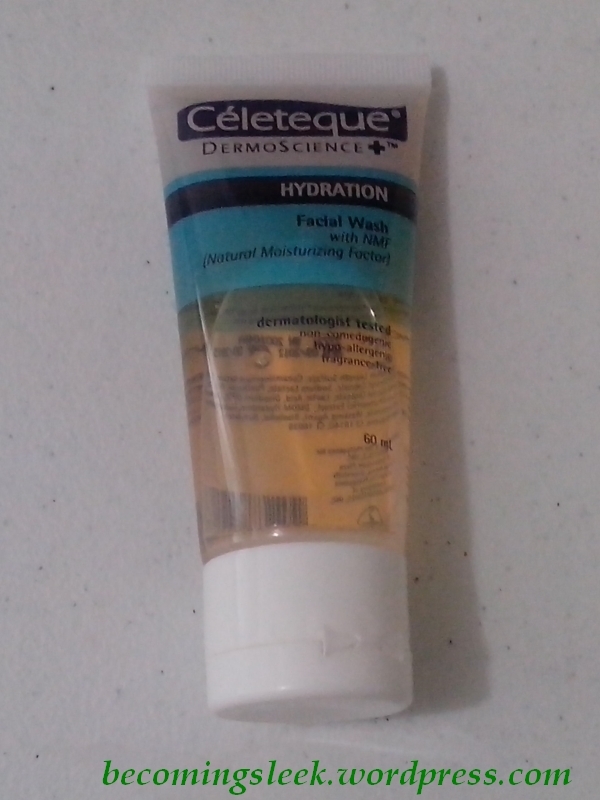 Lastly, I recently added to my routine the Celeteque Hydration Facial Wash. A little goes a long way here. Just a very small dab of product will lather up pretty well, and you can really feel it do its cleaning powers on your face. It doesn’t bring the squeaky clean feel, but the face feels so much brighter and refreshed. This really works for the everyday, non-heavy duty cleansing needs. This facial wash costs Php75 for the 60ml bottle, Php118 for the 100ml, and Php270 for the 250ml pump bottle. 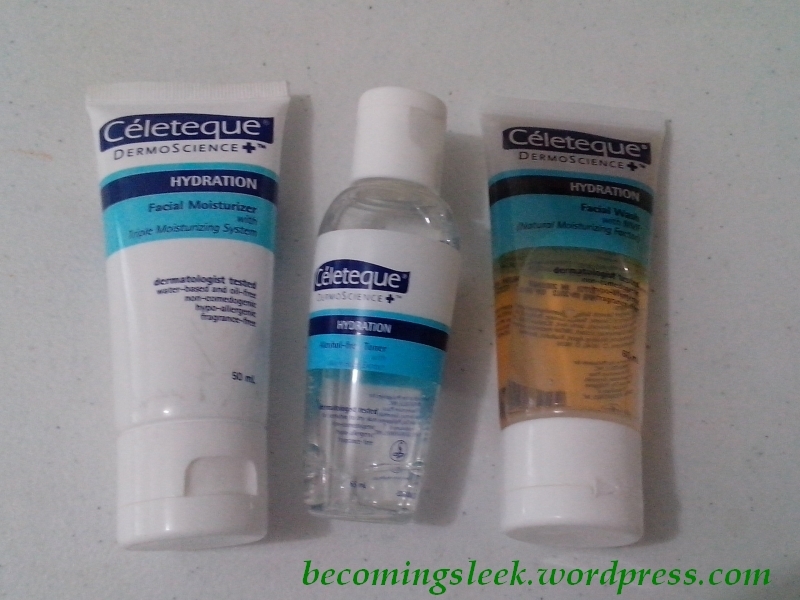 I reviewed a fourth product, the Celeteque Hydration Makeup Remover Cleansing Wipes, in a separate post. Bonus review! 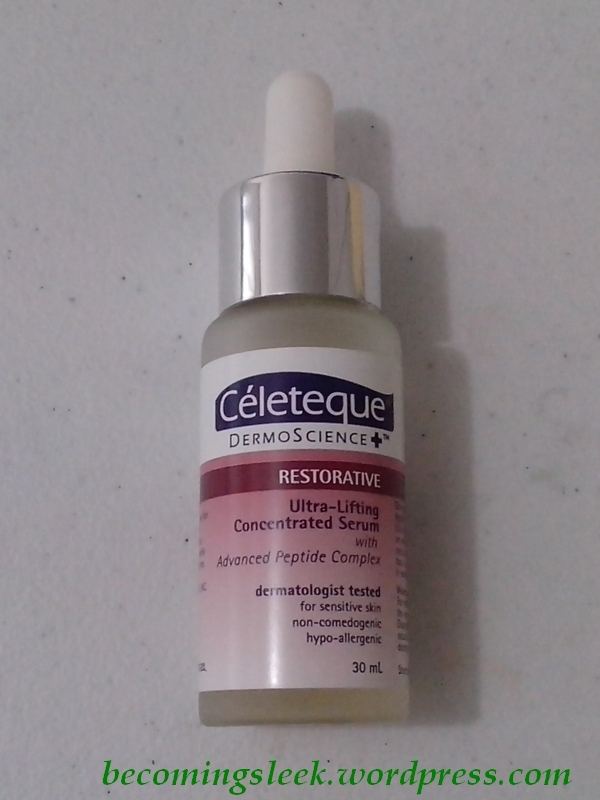 I’ll add a short word on the Celeteque Ultra-Lifting Concentrated Serum from the Restorative Line. I won this product from a Celeteque twitter contest, and I was so lucky to receive a full-sized bottle! This is the first serum I tried (I have started using this before the Shiseido products) and I was really interested in trying it out. This serum has a very thick consistency. The bottle comes with a dropper to dispense the product, and a small squeeze of the dropper will give you a tiny blob of serum. This tiny blob is actually enough to cover the entire face! It glides on smoothly, and doesn’t feel greasy or oily. It gets absorbed by the skin within a couple of minutes too, so again it saves you a bit of time in the evening. The bottle actually recommends you to use this morning and evening, but I opted to only use this with my evening routine. I can say that I am very impressed with this product, and I have confidence that this will help maintain my skin elasticity as well as reduce whatever wrinkles I may be developing. This 30ml bottle costs Php899. Disclaimer: All products except for the serum are bought with my own resources. All opinions are mine and are in no way endorsed by Celeteque. Learn more about Celeteque products in their official website. 6 Responses to "Review: Celeteque Hydration Line"
QUESTION! i’ve been using celeteque hydrating alcohol-free toner yet i noticed small reddened breakouts specially in the morning.. it this a natural reaction? before i tried this product i used Nivea mattyfying toner for a week. Hi Pea! You shouldn’t have a reaction to this. I assume this is the only new thing you tried so far? Maybe you are allergic to one of its ingredients, check with your derma just to be sure! Thanks for visiting! this is also my favorite brand. I have an acne prone skin and this product suits me.